The Imperial Mae Ping Hotel Chiang Mai has announced the appointment of Nongluck Chaithep as director of sales. After more than 14 years with the Amari Rincome Hotel, Nongluck, better known as Khun Toy, decided to accept a new career opportunity. 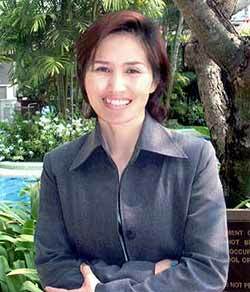 Now she is director of sales at the ‘Imperial Mae Ping Hotel’ as well as the ‘Imperial Chiang Mai Resort Spa and Sports Club’ and ‘Eurasia Chiang Mai Hotel’. She will be busy! Volatility is a fact of life in the stock markets, and therefore for the vast majority of investors. For many investors, however, this volatility is undesirable and inappropriate. The Man Group is the largest independent, specialist manager of alternative investments. These are designed to generate good returns in both rising and falling markets and have been doing so since 1980. They offer capital guarantees, rising guarantees with profit lock-ins and are targeted to make 20% growth per annum. Sounds too good to be true? Well not only that but there is such a thing as a free lunch. Readers of the Chiangmai Mail are invited to join us for a lunch presentation by Sam Gibson of Man Australia at the Westin Sukhumvit, Bangkok, on April 5 at 12.30. To reserve a place please RSVP to Miss Angkanang Putharacha, regional marketing director, on [email protected] or call on 02 650 3123/4.